Had England been the side it is now, Alec Stewart’s numbers would have looked a lot better. The double duties of a batsman (often an opener) and a wicketkeeper, and as a captain later in his career, hampered his numbers to a great extent. Even then, 8,463 runs at 39.54 and 277 victims from 133 Tests are reasonable numbers. Instead, he played his cricket in what can easily be considered the worst decade for English cricket. Along with Michael Atherton, Stewart had tried his level best to keep the torch of English cricket alive through the 1990s, often in vain. England’s failures, though numerous, do not necessarily mean that Stewart (or Atherton) were cricketers of a lesser stature. Cricket, after all, is a team game — and there is only so much you can do for a side on your own. The lion-hearted Surrey star has certainly made his mark as one of England’s legends. Among English wicketkeepers, Stewart has scored the highest number of runs — 4,540 at 34.92. Among all wicketkeepers, he ranks only behind Adam Gilchrist and Mark Boucher. Among all English batsmen, his 8,463 runs at 39.54 ranked second when he retired, behind only Graham Gooch’s 8,900. He was also England’s most capped cricketer with 133 Tests at that time. Stewart was, by nature, an aggressive batsman. Playing for Surrey Second XI in the summers and for the Midland-Guildford Club of Perth in Australian Grade Cricket helped ‘Stewie’ hone his batting against both seam and bounce. Hence, he became a quality batsman against pace, but quality spinners like Shane Warne always seemed to have him in trouble. Additionally, Stewart was a superior batsman, but an inferior wicketkeeper to the likes of Jack Russell and Chris Read, or even Steve Rhodes. With them in the side, Stewart was asked to open. However, when the wicketkeepers failed with the bat, Stewart had to keep wickets, and was often asked to bat down the order. After a few innocuous ODIs, Stewart made his Test debut along with Nasser Hussain as a specialist batsman on West Indian soil — without any doubt the toughest possible opposition in 1990. He began in spectacular fashion: after Patrick Patterson claimed Gooch early, Stewart walked out and counterattacked. The quartet of Malcolm Marshall, Courtney Walsh, Ian Bishop, and Patterson at Sabina Park can be intimidating for any debutant. Stewart walked out, hit three boundaries, and fell for a 12-ball 13. It wasn’t much, but it exemplified his attitude. England did lose the series, but Stewart, playing as a specialist batsman (Russell was the wicketkeeper) batted fearlessly every time he walked out to bat. True, he did not score a fifty, but he played quite a few aggressive cameos that showed the promise he held. He took up gloves for two Tests the next season in Australia. He had scored a 79 and Melbourne and an 87 at Sydney, but the extra responsibility of keeping wickets probably affected his batting: Stewart failed at Adelaide and Perth, and was dropped, somewhat unfairly. West Indies led the series 2-1 when the selectors took a bizarre decision in the last Test of the series at The Oval. They preferred Stewart, the better batsman, ahead of Russell, perhaps the better wicketkeeper of the two. Stewart played a crucial innings of 31, and took four catches. Then, in the fourth innings, he walked out when England were 80 for four chasing 146. Once again he attacked the menacing West Indian fast bowlers, and scored an unbeaten 38 from 50 balls to square the series. It was the first time England had managed to save a series against West Indies in 18 years. Stewart scored his first Test hundred in the 1991 home series against Sri Lanka — a well-compiled 113 not out (and 43) in the only Test. In his next Test at Christchurch, he bettered it with 148. After a failure at Auckland, he scored another century —107 at Wellington, thereby reaching three-figures thrice in four Tests. He was an obvious choice for the World Cup after that. Stewart made an impression in the 1992 World Cup — especially in the league match against South Africa, where he assumed the triple role of opener, wicketkeeper, and captain. After South Africa scored 236 for four, a heavy downpour reduced England’s target to a stiff 226 from 41 overs against the likes of Allan Donald, Meyrick Pringle, Richard Snell, and Brian McMillan, backed by some superlative fielding. Stewart paced his innings beautifully, like any senior professional. He took the attack to the opposition camp, hitting the likes of Donald and Pringle. When he was eventually run out by Jonty Rhodes’ brilliance, he had scored 77 out of a team score of 132. The initial onslaught proved to be enough as England reached home with one ball to spare. In the previous match he had butchered the Sri Lankans for a 36-ball 59. In the next match Stewart scored a quickfire 41 against New Zealand. And in the famous semi-final, also against South Africa at the Sydney Cricket Ground, he scored a crucial 33 that eventually turned out to be the difference between the sides. England lost to Pakistan at home in the series that followed, thanks to some quality swing bowling by Wasim Akram and Waqar Younis. Stewart fought fire with fire, scoring a 261-ball 190 — his career-best — at Old Trafford. He followed this with an even better performance at Lord’s. After a fighting 74 in the first innings, Stewart walked out to open in the second innings and carried his bat scoring 69 out of team’s score of 175. England lost the cliffhanger by two wickets. He also scored his maiden ODI hundred that year — a match-winning 102 at his home ground, The Oval. His performances made him a Wisden Cricketer of the Year in 1993. After the first Test at Calcutta in the disastrous 1992-93 ‘brownwash’, Gooch fell ill, and Stewart was asked to lead England in the second Test at Madras. He was already opening the batting and keeping wickets — but the selectors took mercy on him, and Richard Blakey was drafted in as the wicketkeeper. He made a defiant 74 on his debut as a captain, but England still lost by an innings. Gooch was back for the third Test. England toured Sri Lanka the next month for a one-off Test. Gooch had pulled out, and Stewart was asked to lead (as well as keep wickets) again. It was not the best of Tests for England; though their captain scored an aggressive 63, the Sri Lankan batsmen did well, and Jayananda Warnaweera spun them to a well-deserved victory. Even though he was the vice-captain of the side, the selectors appointed Atherton as the captain after Gooch’s resignation. Stewart’s finest hour came in the Bridgetown Test of 1994. West Indies were still the best team in the world, and had attained an unassailable 3-0 lead after the first three Tests. Richie Richardson won the toss and elected to field on what looked like a seam-friendly pitch. Even England manager Keith Fletcher had admitted that they would have been fortunate to get away with a draw, more so because West Indies had won their last 12 Tests at Bridgetown. The opening partnership turned out to be vital. Stewart, now free from wicketkeeping duties, put on 171 with Atherton for the first wicket. The duo looked comfortable at the crease, and played their shots against Ambrose, Walsh, and the two Benjamins — Winston and Kenneth. Stewart dented the attack further after Atherton’s departure, and eventually finished with a 221-ball 118 decorated with 18 fours on his 31st birthday. Stewart drove with panache, and whenever the fast bowlers pitched short on the hard pitch, he moved swiftly to the back-foot, and cut with ferocity and pulled fiercely. He dominated the four-pronged West Indian pace attack. England, however, collapsed after Stewart’s dismissal, eventually folding for 355. After Angus Fraser took eight for 75 to bowl out West Indies for 304, England needed another special innings to win the Test. Walsh bowled faster and extracted more bounce than anyone else, but Stewart stood firm. England lost three quick wickets, but with the aid of Graeme Hick and Graham Thorpe, he grafted out 143 in 319 balls with 19 boundaries. Stewart remains the only batsman (other than Sunil Gavaskar) to score twin tons in a Test in the West Indies, and is the only one to achieve this feat at the Kensington Oval. If the first innings was a counterattacking one, this one was more of a graft, built out of a patient stay at the wicket rather than eye-catching strokeplay. Brick by brick, the Surrey man laid the foundation of England’s victory, and after England set a target of 446, West Indies collapsed to 237 in the hands of Andy Caddick. It was the first time West Indies had lost at the Kensington Oval since their defeat against Bob Wyatt’s side in 1935. After the historic twin tons at Bridgetown, Stewart finally found a permanent spot in the England side, as a wicketkeeper or as a specialist batsman. Once again, he showed his ability to counter fast bowling when he played several quality innings in South Africa, albeit without a hundred. However, he had not scored anything major for a long time, and was on the verge of being dropped. He had found himself out of the side at Edgbaston against India in 1996. However, Nick Knight broke a finger, and Stewart got a final chance to clutch on to at Lord’s. He top-scored in the second innings with 66, and found his spot back. He also scored 50 in the third Test at Trent Bridge. The two-and-a-half year run-drought without a hundred ended with against Pakistan at Headingley in 1996. Up against the likes of Wasim Akram, Waqar Younis, and Mushtaq Ahmed, Stewart opened batting and scored a 315-ball 170 with 24 fours. That was the only Test of the series that England managed to save. Stewart, however, continued his run, following his 66 and 50 with scores of 39, 89, 170, 44, and 54. He extended his run even further. He scored 48 and a 76-ball 73 in the next Test at Bulawayo (the first time a Test was drawn with the scores level), and after a 19 in the first innings at Harare, he scored an unbeaten 101 in the second. He followed this with a 277-ball 173 at Auckland, and a 52 in the only innings in an innings victory at Wellington. He did not do too well in the subsequent Tests, but still managed to reach double-figures in 18 consecutive innings. Australia won the Ashes 3-2 the next year. 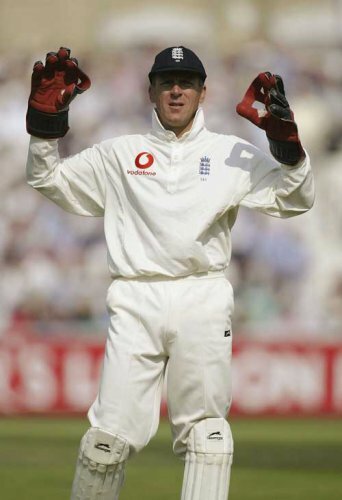 Stewart did not do too well, but in the last Test, he managed to catch Greg Blewett off Phil Tufnell in the first innings in spectacular manner. There had already been speculations regarding Stewart’s abilities to keep wickets against quality spin, but he silenced his critics with that catch: Blewett tried to sweep, the ball took his edge and flew towards the vacant leg-slip area. Stewart, all of 34 years, flung himself to his left, and picked up the ball inches from the ground, resulting in a tumble and an amazing catch. England toured West Indies next, and though England lost the series 3-1, Stewart reached double-figures in 10 consecutive innings (scoring 443 in 10 innings at an average of 44.3}. Upon his return to England, Stewart was appointed captain as a replacement of Atherton. Unlike Atherton, Stewart was more of an ‘establishment man’, though as a captain he preferred to impose a strict military discipline on his side. It came good, though: in his first complete series as captain, he led England to a 2-1 victory against South Africa at home after trailing the series 0-1 after three Tests. The victory, though, was set up by Stewart in the third Test at Old Trafford. After South Africa had declared at 552 for five, Stewart scored a defiant 40 as England collapsed to 183. Hansie Cronje enforced the follow-on after a lead of 369, and the captain walked out to bat with the score on 11 for two. He added 226 with his old ally Atherton, scored a 317-ball 164, and England played out time, finishing with 369 for 9. This was the second time in history when a Test was drawn with the scores level. The innings turned the series on its head, and England bounced back to clinch the series with emphatic victories at Trent Bridge and Headingley. England had won a series involving five or more Tests for the first time since the 1986-87 Ashes. Stewart, having had an 18-innings run of two-digit scores a year and a half back, now extended it to a run of 20: he had scored 50, 73, 44, 83, 20, 12, 12, 48, 22, 79 in West Indies, and 49, 28, 14, 56, 40, 164, 19, 45*, 15, and 35 against South Africa. That year he was awarded an MBE for his ‘great contribution to the cricketing world’. His unusual, if eccentric, style of captaincy earned him the nickname ‘Gaffer’. That elusive Ashes hundred came next year. Though Australia were leading the series 2-0, the series was still alive going into the fourth Test. Mark Taylor won the toss and put England in; Glenn McGrath reduced England to 0 for 2 in the third over of the Test. It took another Stewart epic to bail England out of trouble: he took on attack consisting of McGrath, Damien Fleming, and Stuart MacGill, and smashed a 160-ball 107 to guide England to 270 at the Melbourne Cricket Ground. After Australia acquired a 70-run lead, Atherton registered his pair, and once again Stewart put up a gallant fight, scoring 52 out of 78 scored during his stay at the wicket. Defending 175, Dean Headley bowled England to victory as Australia collapsed from 130 for 3 to 162. The year 1999 ended, and Stewart finished with 6,407 runs from 93 Tests in the decade. He had also scored 12 hundreds, and was the leading run-scorer of the 1990s, 36 ahead of Mark Waugh. Stewart played his 100th Test at Old Trafford against the West Indies in 2000. It was yet another stellar performance from Stewart. After West Indies were bowled out for 157, Stewart found himself in a familiar situation as Walsh had reduced them to 17 for 3. Once again the bat flailed, Ambrose and Walsh conquered, and Stewart engineered 105 in 153 balls with 13 boundaries after keeping wickets — all at the age of 37. The Test was drawn, and Stewart became the fourth player to score a hundred in his hundredth Test after Colin Cowdrey, Javed Miandad, and Gordon Greenidge. He stood down from captaincy after the Test as Hussain took over. The next year, though, when Hussain was injured for the Old Trafford Test against Pakistan, Stewart led England for one final time. Stewart had opted out of the tours of India and New Zealand, and he was as good as written off. Even ECB did not renew his contract, and appointed James Foster in his place. However, Foster broke his arm before the home series against Sri Lanka and India, and Stewart got another chance. He came back strongly with a 190-ball 123 with 17 fours at Old Trafford. Later that season, against India at Lord’s, Stewart played his 119th Test, going past Graham Gooch’s tally of 118. His run hunger was immense even at 40. Later that year he went to Australia for one final Ashes tour. In his last Ashes Test in a dead rubber at Sydney, Stewart singled out Brett Lee for some special treatment, scoring 71 in 86 balls with 15 fours. There were rumours that he had caught chicken pox before the second innings, but he walked out and scored 38 more before Caddick bowled out Australia to end in a 225-run win. He played the ODIs as a wicketkeeper-batsman, and then, closing on his 40th birthday, was selected for the World Cup. He top-scored for England with 46 in his last ODI, but Michael Bevan and Andy Bichel put on a miraculous ninth-wicket partnership to pull off an amazing victory; it remained Stewart’s last ODI. Now past 40, Stewart decided to call it quits after one final season — against Zimbabwe and South Africa at home, all as wicketkeeper. He scored 72 in the third Test at Trent Bridge, when England squared the series from being down 0-1. He scored 38 in his last Test innings at The Oval, and England levelled the series 2-2. Stewart’s retirement attracted a lot of tributes from the world of cricket. The Surrey coach Keith Medlycott called him “the Alan Shearer of cricket” because of his work ethics and longevity. He was awarded on OBE later that year. In 2004 he became a Founder-Director of Arundel Promotions to enhance player-management representation. He joined Surrey CCC as a part-time consultant to the coaching stuff and as a mentor in 2009. He is still closely attached to the Surrey and England cricket team, and works as their ambassador. The occasional dry sense of humour prevailed through the dressing-room as well as in the commentary-box. He still continues to support Surrey Cricket Club and Chelsea Football Club. At the first opportunity to use a jersey number, Stewart had always used the No 4 — the same as his childhood hero John Hollins. On the field, though, he was as impeccable and immaculate as anyone else — and a role model for everyone, especially to his juniors. His professional ethics made him stand out in the field, earning him respect from everyone. When he bowled (he was a terrible bowler) in West Indies in 1994, managed to unleash a strange bouncer (which reached the wicketkeeper on the second bounce), he appealed to the umpire — to be given a warning that he had bowled his first bouncer of the over. The commentators said it was his ‘lifetime achievement’. The ground was in splits, but the respect for the great man never waned. It should have come much earlier in the article that Micky Stewart, who had played 8 Tests for England and had captained Surrey, was Alec’s father. Alec’s mother Sheila was an excellent netball and hockey player. But the Stewart family never mentioned the connection they had with Alec — they wanted their son to make a name on his own. 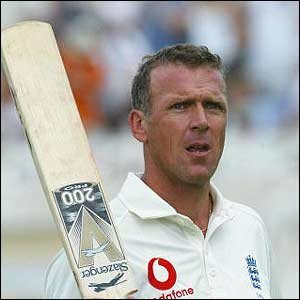 Alec Stewart was born on 8.4.63 and he ended his Test career amassing 8463 runs. What an oddity!